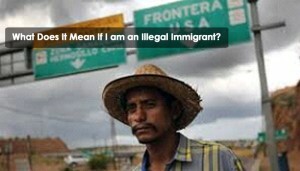 What Does It Mean If I am an Illegal Immigrant? Becoming an illegal immigrant is a tremendously dangerous and stressful experience. Individuals who move to different countries without the required paperwork and visa documentation face the risk of being deported and have a life that is very shadowed by their illegal immigration status. Specifically, without having an appropriate visa, individuals who are living in their non-native countries do not have working rights. This means you are going to suffer a very hard life trying to scrape together enough money to feed yourself and your family. Granted, this difficulty will differ depending on the skills that you have, or the city to which you have immigrated. Certain cities in Europe or Asian nations may be easier to find work in restaurant kitchens, or even as freelance employees. However, other nations or cities that have much higher rates of employment are going to be much more competitive to find work. You might struggle to find food, never mind being in a new city whose language you might not speak and whose customs you might not understand. It suffices to say, becoming an illegal immigrant is not advisable. Will My Life Really Be That Hard as an Illegal Immigrant? In a word, yes. Illegal immigrants in the United States and across Europe have been getting significant press coverage of late, and the reason is clear. People are threatened by illegal immigrants and those who have worked hard to immigrate legally are also angered at those trying to cheat the system. Therefore illegal immigrants get disdain from all sides, No one wants to take their side or take care of them, because everyone sees them as cheaters. It is true that applying to immigrate to another nation can be overwhelming and costly. To not become an illegal immigrant, you need to get all your paperwork in order and wait your turn to immigrate to a new nation. This may sound tiring but it is very worth it. Life as an illegal immigrant is not worth it. Hire a professional to get your paperwork in order if the thought of doing all of that is daunting. But whatever you do, do not try to simply walk into another nation and build a life there.